I really do love this series, but it really is reminding me a lot about twilight.And I didn't really like that the author started out this book with Kerry's point of view. I thought it was kinda a big thing since the first two books were in Mairin's point of view. But I kinda like seeing Kerry's pov because she can actually see the love that Mathias has for Mairin. Plus, we can see into Xavier's life. Gosh. Lane! How could he! He's evil. It's his own fault that Dorothy doesn't love him. Maybe if he was nicer, they would've still been friends, but nooo. He had to just go and do that thing he did. I really love Xavier and Kerry's romance. Though, I think it was a bit too fast. Like Mairin and Mathias's romance too. It was way too fast. But I really loved that line where Mairin was watching Ian looking at Kerry with love in his eyes. I'm not sure it was in this book though, since Mairin was looking at him.I am so glad that Kerry didn't turn into one of them. I mean, I kinda thought it would be a bit cool. But I wouldn't want to be one.Overall, I did enjoy this book a lot! I'm really hoping the next two will be better though! 4 Stars! The story continues with the emphasis more on Xavier and Kerry. Their love growing amidst uncertainty and turmoil of jealousy, fear and the threat of change in her life. Mairin and Matthias are in the back ground as guards, always close. We are introduced to Lane a werepanther with a revenge against Dorothy, Xavier’s mother. The strong characters of Xavier and Kerry coming alive to make this a good read. I really enjoyed this part more then the others so far. For its simplicity and depth making it more believable. The story is growing and now I am wondering what will happen next. For the first time really looking forward to the next book. Omg!! As a person who can not stand Twilight in any form, I absolutely love the Highland Home series. Although it took me a while to finish (writing my own novel), I was easily pulled in from where I left off. I'm glad she didn't focus this series completely on Mairin and Mathias, but also let us get a glimpse into the lives of Kerry and Xavier. As I got to the middle, I was pretty much on the edge of my seat waiting to see the fate of one if the characters. All in all, I loved this book and would highly recommend it!! I received all 5 books in the series for winning a contest on a book blog.I read all 5 books in one night as I couldn't put them down!If you're a fan of vampires, shifters... heck, paranormal in itself, Irecommend this book (series).The characters were well written. The story grabbed you from the start and kept you involved and entertained. Yes, I would recommend reading them in order as it's hard to follow otherwise. 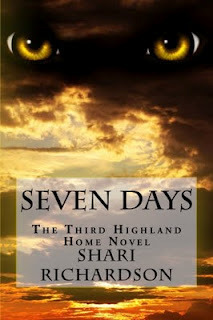 This is the third book in the Highland Home series. I started reading this and then realised it was the third book in the series so I had a bit of a reading fest. (Well it was raining outside!) Quickly read the second book , then got back to this one. Again very good, borders on Twilight and I expect will get lots more comparisons between the two, but I think it can hold it's own corner. Shari Richardson - Shari Richardson holds a master's degree in English Education and has spent much of her life teaching students the joy of reading and writing. Her love of writing began when she was in elementary school and has carried through her entire adult life. Shari lives in Pennsylvania with her two Chihuahuas.